Poochyena in game: 6,077 Who? Important notice! Pokemon Poochyena is a fictional character of humans. 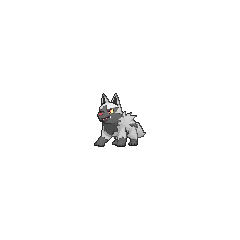 Poochyena (Japanese: ポチエナ Pochiena) is a Dark-type Pokémon introduced in Generation III. It evolves into Mightyena starting at level 18. Poochyena is a quadruped Pokémon similar in appearance to hyenas and canines. Its body is primarily gray with a black face and throat, paws, and belly. Its eyes are red with yellow sclerae, and it has a red nose. Its lower jaw has two pointed teeth sticking out. The fur at the base of its tail is rumpled and shaggy. 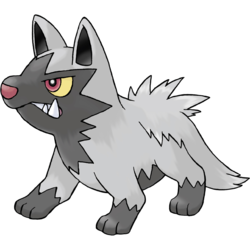 Poochyena has gray paw pads on its three-toed paws. Poochyena has a very keen sense of smell, allowing it to find and chase its prey with ease. It takes a bite at anything that moves, and makes the hair on its tail bristle out to try to intimidate its foes. Known for its tenacious nature, it chases after prey until the victim becomes exhausted. If its prey strikes back, it may turn tail. It is omnivorous and will eat anything. This Pokémon lives in grasslands and forests. When Professor Birch got separated from Ash in Get the Show on the Road, he was attacked by a pack of Poochyena (similar to what happens in Pokémon Ruby and Sapphire). In A Bite to Remember, Max befriended a Poochyena and helped it to evolve. One of the Gym Badge thieves from The Blue Badge of Courage had a Poochyena. A wild Poochyena appeared in A Six Pack Attack! to assist Professor Birch in finding Professor Oak, May, and Max. A Poochyena appeared in An Explosive Operation!, under the ownership of a Team Flare Grunt. A Coordinator's Poochyena appeared in All Things Bright and Beautifly! competing in the Rustboro Contest. A Poochyena was seen inside the Slateport City Pokémon Center in Now That's Flower Power!. A Poochyena belonging to a Coordinator appeared in Win, Lose, or Drew! competing in the Slateport Contest. Two Poochyena appeared in Jirachi: Wish Maker. One was seen playing with its owner in the opening of the film while the other one was a wild Pokémon that lived in Forina. Poochyena appeared in both Disaster of Disguise, and Disguise Da Limit. It first appeared under the ownership of a young girl. Later, during Mrs. Grimm's flashback, it was revealed that she owned one as a child. A Poochyena appeared in Destiny Deoxys. A Poochyena appeared in Hi Ho Silver Wind! under the ownership of a Coordinator competing in the Hoenn Grand Festival. A Trainer's Poochyena appeared in Off the Unbeaten Path participating in the Pokémon Orienteering. A Poochyena made a brief appearance under the ownership of a Pokémon Trainer in the Lily of the Valley Conference in An Old Family Blend!. A Poochyena appeared in Lumiose City Pursuit!. Two Poochyena appeared in Grooming Furfrou!. A Trainer's Poochyena appeared in Foggy Pokémon Orienteering! and Battling Into the Hall of Fame!. A Trainer's Poochyena appeared in Garchomp's Mega Bond!. A Trainer's Poochyena appeared in A Performance Pop Quiz!. AG011 Poochyena Ash's Pokédex Poochyena, the Bite Pokémon. Poochyena is the pre-evolved form of Mightyena. Its biting strength is superior to other Pokémon, and has the endurance to chase opponents down until completely exhausted. A wild Poochyena appeared in The Cavern, where it was running away from a storm which a Primal Kyogre was involved. A Poochyena named Nana is first seen in Ruby's possession, one of the three Pokémon given to him from his father, Norman, when he was very young. Even 5 years before the events of the RS series, Nana was shown to be a formidable battler, injuring a wild Salamence teaming up with Kiki and Rara. While it still hadn't evolved, Ruby saw few wild Mightyena that attacked Birch and envied how splendid their fur looked. A few chapters down the line, Ruby would obtain his own Mightyena on Dewford Town when he met up with Steven, and Nana evolved together with Kiki, who touched the champion's Moon Stone. This new evolved form saw a furthering of Nana's abilities, allowing it to perfect its Hyper Beamattack. Kanata has a Poochyena in the Pokémon Chamo-Chamo ☆ Pretty ♪ manga. Pokémon Mystery Dungeon: Explorers of Time and Explorers of Darkness: Three Poochyena form Team Poochy. They specialize in catching criminals. The brothers chase their target until they are tired and then finish them. Poochyena is an omnivore - it will eat anything. A distinguishing feature is how large its fangs are compared to its body. This Pokémon tries to intimidate its foes by making the hair on its tail bristle out. It savagely threatens foes with bared fangs. It chases after fleeing targets tenaciously. It turns tail and runs, however, if the foe strikes back. It has a very tenacious nature. Its acute sense of smell lets it chase a chosen prey without ever losing track. A Pokémon with a persistent nature, it chases its chosen prey until the prey becomes exhausted. It chases its prey until the victim becomes exhausted. However, it turns tail if the prey strikes back. Poochyena is an omnivore—it will eat anything. A distinguishing feature is how large its fangs are compared to its body. This Pokémon tries to intimidate its foes by making the hair on its tail bristle out. Moves marked with a superscript game abbreviation can only be bred onto Poochyena in that game. 51%-100% HP Grr... I smell foes! 26%-50% HP Grr... My health is halfway down. Level up Grrr... I leveled! My nose grew even more sensitive! The more disruptions on the board, the greater the damage. 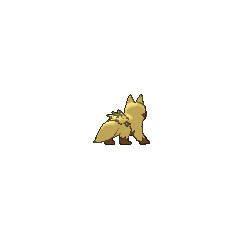 For other sprites and images, please see Poochyena images on the Bulbagarden Archives. Poochyena has the lowest base HP, Special Attack stat, and base stat total of all Dark-type Pokémon. It shares some similarities with both wolves and hyenas. However, its small size, typically tenacious nature, and affinity for biting calls to mind Tasmanian devils. Poochyena is a combination of pooch (slang for dog) and hyena. Pochiena may be a combination of Pochi (a popular name for dogs in Japan) and hyena.